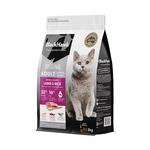 One of the most positively reviewed cat foods by independant sources, Black Hawk cat food is a standout Australian brand of pet food formulated with a holistic approach to animal nutrition. 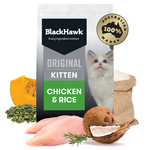 With its loyal following, Black Hawk has risen to become one of the more affordable premium pet foods, with the added benefits of hormone-free Australian meats at the top of their ingredients list. 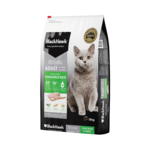 Made right here in Australia, Black Hawk is a wonderful choice for pet parents who feel that their cat should follow a more natural diet. Black Hawk's excellence only rises from there. It's also known for its inclusion of food-grade emu oil (an ingredient known for its anti-inflammatory, anti-fungal and healing properties). Black Hawk cat food also boasts functional, natural ingredients like blueberries for antioxidants and rosemary to assist hair growth and combat bad breath. Put simply, Black Hawk will nourish your cat from the inside out. 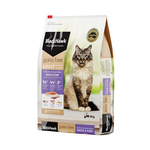 Black Hawk's grain-free recipes are ideal for cats with skin and stomach sensitivities, and replaces grain-based carbohydrates with nourishing potato and field peas. High-quality meat meals (superior to standalone meat, with its higher water content) are always the first ingredient, which is perfect for cats as they are obligate carnivores and can suffer without quality meat in their diet. In fact, Black Hawk's grain free varieties for cats are 56% meat, legumes, and pulses - all of which are unlikely to cause tummy upsets in your cat. 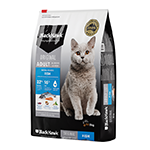 Wondering what our recommended Black Hawk cat foods are? At Pet Circle, we carry a wide range of Black Hawk cat food - you can also enjoy the convenience of free delivery over $29 straight to your door, always at the best price with our price match guarantee. Please see individual products for a listing of ingredients as well as feeding guidelines, to make sure your cat is receiving the correct diet for their lifestyle.